Being a great cook day in and day out means making the best of what you have on hand. A great cook is a versatile cook. Of course, it helps if you have a versatile recipe and a few hints along the way. 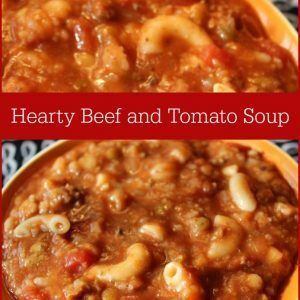 Tomato and Beef Soup is a versatile recipe. Use whatever kind of small pasta you have in the cupboard. Small because it is easier to eat in soup. I always have barley on hand – because I like it and use it often — but not always split peas and lentils because I buy them only for specific recipes and don’t replace them immediately. Increase the amount of barley or pasta to make up for the missing ingredient. Diced tomatoes make a nicer looking, neater to eat soup but you can use whatever kind of tomatoes you have on hand. If you’ve been cooking for a while, these things may seem common sense. But if you are just starting out in the kitchen or “expanding” your horizons, these little tips can be helpful. And if you are working, raising children and a million other things, it’s easy to be so tired you can’t even think. #mommybrain is real! You can make Tomato and Beef Soup from scratch in just over an hour. If you brown one pound packages of ground beef and freeze them when you come home from the grocery, it will save some hassle on a busy evening after work. Just measure the beef broth and dry ingredients, thaw a package of browned ground beef and dump it, the tomatoes, tomato paste and pasta into the broth mixture after 45 minutes of simmering and simmer another 15 minutes. You can make and freeze several batches for cooking later. Place peas, barley, lentils, dried minced onion, Italian seasoning, rice, garlic powder and pepper in a quart zipper bag. Measure pasta into snack size zipper bag and add to the same bag with the other dry ingredients. Brown ground beef and place in gallon zipper bag. Add the quart bag with the dry ingredients and label before freezing. I have a very small freezer so I’d rather mark cans of tomato paste, diced tomatoes and beef broth with the name of soup and set aside in special spot in the pantry. But if you have freezer room, go ahead and add tomatoes, tomato paste and even the beef broth to the ground beef in the gallon zipper bag and tightly seal. Place in a second gallon bag and add the quart bag into the second bag to make one neat package. Label with name and cooking directions. Set in the refrigerator the night before so it will be thawed and ready to cook when you get home from work the next day. 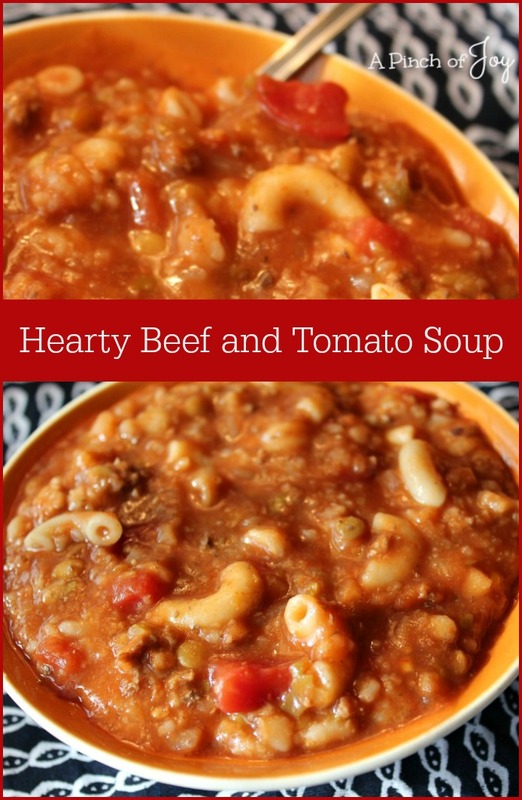 Filling and, oh so good, Beef and Tomato Soup is easy to make from scratch. OR you can make ahead and freeze, for quick cooking. Pour beef broth into large pan. Add split peas, barley, lentils, rice and seasonings. Bring to boil, cover and then lower heat to simmer for 45 minutes. Brown ground beef, drain fat if needed. Stir tomatoes and tomato paste into ground beef. Cover and keep warm over low heat while broth finishes simmering. Stir beef and tomato mixture into broth mixture. Add pasta. Cover and continue to simmer for fifteen minutes or until pasta, lentils, peas and barley are tender. Place peas, barley, lentils, dried minced onion, Italian seasoning,rice, garlic powder and pepper in a quart zipper bag. Measure pasta into snack size zipper bag and add to the same bag with the other ingredients. Brown ground beef and place in gallon zipper bag. Add the quart bag with the dry ingredients and label before freezing. Mark cans of tomato paste, diced tomatoes and beef broth with name of soup and set aside in pantry. OR add them to the ground beef in the gallon zipper bag and tightly seal, then place in a second gallon bag and add the quart bag into the second bag. I’m so glad you stopped by today! Be sure to follow A Pinch of Joy so you don’t miss a thing! If you found this helpful or inspiring, please share! Your support of A Pinch of Joy is appreciated!